Detail Data has examined archive documents and interviewed women and children who survived conditions in the homes for unmarried mothers that existed in Northern Ireland until the early 1980s – including institutions run by the Catholic Church, the Church of Ireland and the Salvation Army. Files at the Public Record Office of Northern Ireland (PRONI) include correspondence homes had with government departments, the minute book for one home and inspection records for a children’s home where some of the children would have moved to after their birth. Pregnant girls as young as 13-years-old were sent into mother and baby homes and a letter from 1945 shows how the chairman of a home for unmarried mothers appealed for money and warned the government about the high infant mortality rate among "illegitimate" children. Our research led us to look at the treatment more generally of children labelled as 'illegitimate' in Northern Ireland's recent past. Official records from 1942 show that the 'legitimate' infant mortality rate for Northern Ireland was 72 per 1,000 births - it was 157 for 'illegitimate' children. An analysis of burial records for Milltown Cemetery in west Belfast and a search for death certificates means we can reveal that at least 43 babies of 63 children who died at two Belfast children’s homes in just one year, died from severe malnutrition. The Catholic Church's Down and Connor Diocese, which owns the burial records, said that the findings of The Detail's investigation "add further to our shame". In a statement, the diocese said: "These findings demonstrate how as a Church and as a society we have failed to protect the most vulnerable members of our community." The Commission of Investigation into Mother and Baby Homes in the Republic of Ireland announced in March that significant quantities of human remains had been found buried under the site of a former institution for unmarried mothers run by the Sisters of the Bon Secours in Tuam, Co Galway. The site of former mother and baby home in Newry - Marianvale run by the Good Shepherd Sisters - is currently being examined by forensic archaeologist Toni Maguire. To date, no human remains have been found and just a small area of interest remains to be searched. While religious institutions ran many of the homes, our research has confirmed the central role of the state in appeals for additional funding, official involvement in women and girls being sent to homes, inspection reports and the maintenance of records of child deaths. The Executive Office has confirmed that an independently chaired inter-departmental group - jointly sponsored by the Executive Office and the Department of Health - has been established to take forward work relating to clerical child abuse and residents aged over 18 from mother and baby homes and Magdalene laundries who fell outside the remit of the Historical Institutional Abuse (HIA) Inquiry. The group held its first meeting in March. It has not yet met with members of Birth Mothers and Their Children for Justice NI. The HIA Inquiry examined systemic failings by institutions which provided residential care for children aged under 18 during the period 1922-1995. Former residents of mother and baby homes and their children, the Good Shepherd Sisters, the Salvation Army, the Sisters of Nazareth and Down and Connor Diocese have all confirmed to Detail Data that they would be willing to cooperate with a public inquiry if the Executive Office agrees to one taking place. The personal testimonies: "We were vulnerable and we were innocent and, to be quite honest with you, the men got away with it. They carried on with their lives." We record disturbing accounts of cases from the 1960s and 70s including a woman who lived in a home during her first pregnancy and the stories of children born to unmarried mothers who were adopted or fostered. Files we accessed at the Public Records Office of Northern Ireland show that pregnant girls as young as 13-years-old were sent to stay in mother and baby homes. The minute book for one home documents births, baby deaths, stillbirths, adoptions and babies sent to children's homes from 1934 to 1949. The lost lives: The 43 babies who died from malnutrition in one year. 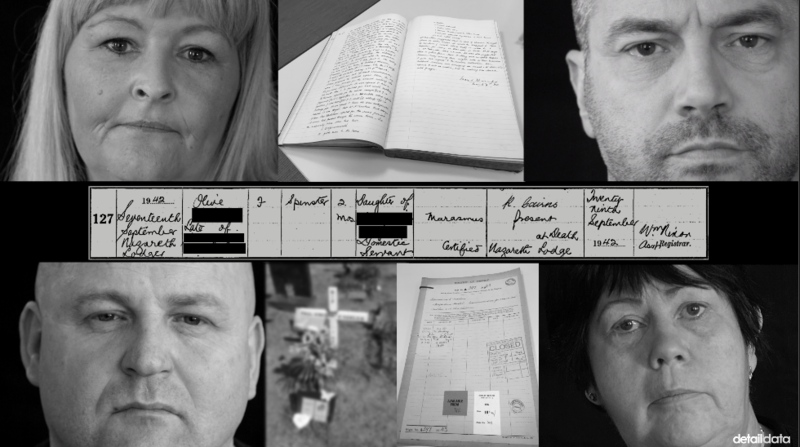 We examine burial records and death certificates relating to 63 children who died in two Belfast children homes in 1942. Fionnuala McGoldrick: "Why did my brother die and I survived?" Fionnuala's brother Paul is buried at Milltown Cemetery's Bog Meadows site. Their unmarried mother was sent to a mother and baby home for both of her pregnancies. Reuniting families: "Virtually every woman I have spoken to says they have thought about their child every day." Many birth mothers remain traumatised by their experiences in mother and baby homes and the loss of their children, according to the head of an adoption charity who reunites families. Can a public inquiry take place? : "I think we need an inquiry and what we will find will shock this society to its core." Amnesty International is calling for a “proper human rights compliant public inquiry” after receiving allegations from women of forced labour, arbitrary detention, ill treatment and the illegal adoption of babies in former mother and baby homes. We ask The Executive Office and Catholic Church for their view. Files at the Public Record Office of Northern Ireland (PRONI) include correspondence homes had with government departments, the minute book for one home and inspection records for a children’s home where some of the children will have moved to after their birth. Burial records for Milltown Cemetery in west Belfast and death certificates also revealed disturbing information on the cause of death of babies and infants at two Belfast children’s homes. The site of a former mother and baby home in Newry is currently being examined by a forensic archaeologist. We record disturbing accounts of cases from the 1960s and 70s including a woman who lived in a home during her first pregnancy and the stories of children born to unmarried mothers who were then adopted or fostered. Files we accessed at the Public Records Office of Northern Ireland show that pregnant girls as young as 13-years-old were sent to stay in homes. The minute book for one home documents births, baby deaths, stillbirths, adoptions and babies sent to children's homes from 1934 to 1949. 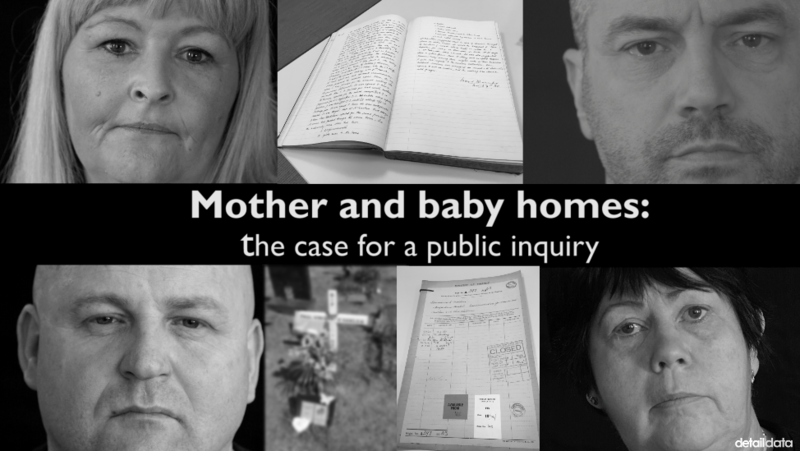 We examine burial records and death certificates relating to the deaths of 63 children in two Belfast children homes in a single year. Fionnuala's brother Paul is buried in Milltown Cemetery's Bog Meadows. Their unmarried mother was sent to a mother and baby home for both of her pregnancies. Support for an inquiry: "I think we need an inquiry and what we will find will shock this society to its core." Amnesty International is calling for a “proper human rights compliant public inquiry” after receiving allegations from women of forced labour, arbitrary detention, ill treatment and the illegal adoption of babies in the homes. We asked The Executive Office and the Catholic Church for their view on our findings.